Hi there and happy Tuesday! How’s your week going thus far? Despite the cold weather and snow(!!) we’ve been having here I’ve still been craving salads. 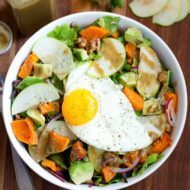 Lunch or dinner, it doesn’t matter — all I want is a huge salad that’s flavorful, easy to throw together and totally satisfying. To make the prep easy I like to have a couple quick cooking protein options, healthy fats and a variety of veggies on hand. 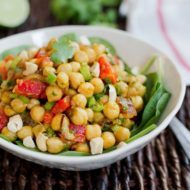 Some of my favorite protein options include shrimp, edamame, tempeh, tofu, hard boiled eggs and chicken. I’ve talked about it before, but my favorite chicken is the Whole Foods Health Starts Here thai curry chicken. It’s curry flavored, obviously, but also has a bit of spice and salt to go along with it. It’s really the only chicken I’ve LOVED since introducing meat back into my diet. I like it so much I’ve even made my own version of the Whole Foods seasoning blend so that I can make the chicken at home without having to buy the seasoned skewers from the meat department. Last summer I made a salad using the thai curry chicken and donut peaches. It’s delicious, but donut peaches aren’t in season right now so I decided to come up with another combo. This version has fresh pineapple (to ease the spice of the chicken), red onion, cucumbers, bell pepper and creamy dijon dressing. It’s fresh, bright, flavorful and filling. 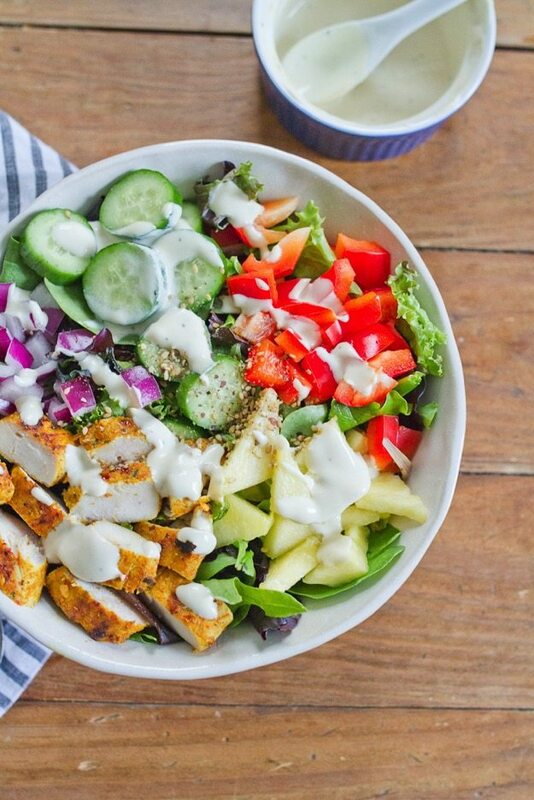 Basically, everything you want from a meal-sized salad. Combine the curry powder, onion powder, crushed red pepper flakes, sea salt and parsley in a small bowl to create the rub. Use as much of the rub as needed to cover each chicken breast. You may have a bit of the spice rub left over — just store any of the remaining non-contaminated spice mix in an airtight container for later use. Heat 1 teaspoon of coconut oil in a skillet over medium heat. Placed seasoned chicken breasts into the skillet and cook for about 10 minutes on each side, until juice runs clear. Remove from heat and let sit for a few minutes to cool. Once cool, slice the chicken for the salads. 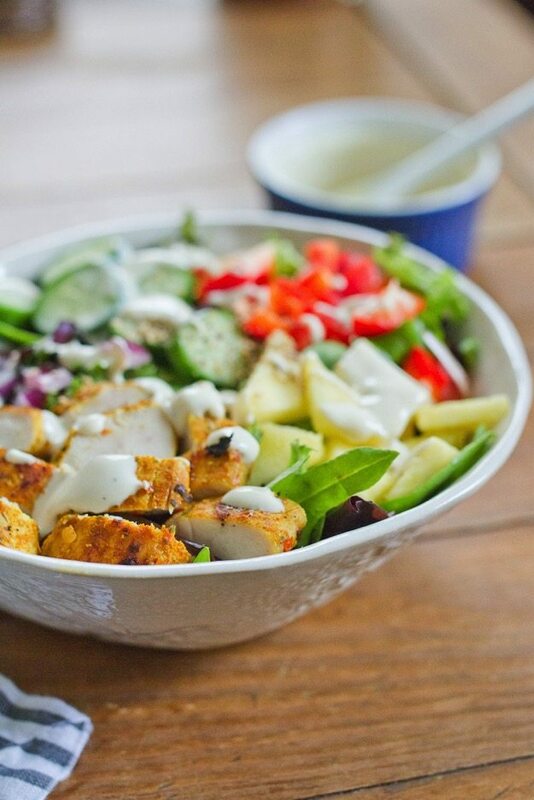 While the chicken is cooking, place all ingredients for the dressing in a small jar or bowl. Whisk until combined and set aside. Divide your greens, bell pepper, cucumber, pineapple and red onion on to four plates. Top each with a portion of chicken. Drizzle a little creamy dijon dressing over each salad and top with a sprinkle of gomasio, if using. This looks fantastic! I can’t wait to try it! This looks really good! 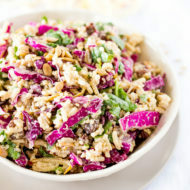 I am always looking for fun ways to liven up my salads. Oh this looks amazing!! Will definitely have to try that chicken! Looks great! The flavors sounds delicious. 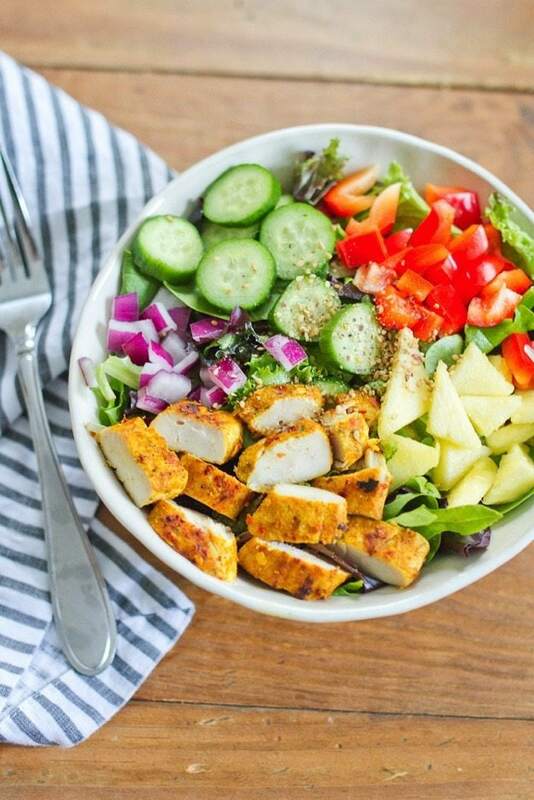 This salad looks SO delish! Sorry 😉 I’m eating curry tofu for lunch inspired by the whole foods salad bar. Great spice combo I’m sure is great on chicken! Can’t go wrong with a huge salad. So many wonderful colors and ingredients in one salad! This looks amazing! I can’t wait to try it, definitely on my to make list. Looks yummy! Did you do a post about your decision to introduce meat into your diet? I’m considering that move for myself and am curious about others’ experiences. Hi Rachel. I haven’t done a full post about it because I didn’t know if folks would be interested. I started eating meat again a little over a year ago after being Pescatarian for 6 years. I was craving it (which had never happened before) so I started experimenting with adding it back in slowly. It’s been an interesting transition, but a good one for my needs. I still don’t eat it all that often and I’m very picky about what meat I’ll eat — I like to make sure it’s sustainably and humanely raised, without antibiotics, growth hormones, etc. I typically don’t order meat out at restaurants unless it says on the menu where the meat is from and we buy the meat we eat at home from Whole Foods, the farmers market or a local butcher. Overall, I haven’t had any digestive problems or other issues from adding meat back into my diet. It’s easier to eat more protein and it keeps me full better than beans and grains. This recipe looks delish – so colorful, lots of good flavors. Thanks for sharing! Also, I listened to your interview with Lauren from Girls Gone Sporty for her podcast this morning. I think it was from a while back, but it was a great one to listen to! Thanks! 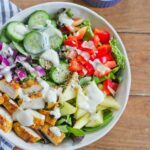 I’m always craving a nice crisp salad and this one looks like it is chock full of crunchy goodness with a healthy dose of protein. Yum! Thanks lady! Hope you are doing well. What would you suggest as a replacement for the greek yogurt if you are dairy free? I’d use a non-diary yogurt like coconut milk yogurt or almond milk yogurt.